These are some of the exciting ballroom dances we offer at William Maslin Dance Studios. The Fox Trot is a smooth and flowing dance. Like its name, it began as a ‘trot’ with a natural ‘down, up’ movement throughout the dance, like walking. It is refined to a smooth flow as you develop your skill. The American social Fox Trot is a wonderful foundation to advance your dance ability to include the slow fox trot and the faster quickstep variation. A graceful, smooth, flowing dance, characterised by a distinct ‘rise and fall’ movement. The Waltz is the romantic dance, with stylish arm and head movements, making the dancers look like they are gliding across the floor. The Tango is a dance of passion, dominated by slow, smooth steps, accented with sharp, staccato movements. It is a travelling dance, but unlike others it has less urgency to move about, and alternates throughout the dance between moving and spot accents to suit the feeling of the music. The Viennese Waltz is the oldest of all the ballroom dances, danced at the fast tempo that characterised the first waltzes. Later versions, such as the French and Boston waltzes, are much slower. The golden age of the Viennese Waltz in Europe was the early 1800s, when Johann Strauss was composing. Its popularity has gone up and down, but it has never gone out of style. It is classic “old-school” ballroom. The Quickstep is a light hearted member of the standard ballroom dances. The movement of the dance is fast and powerfully flowing and sprinkled with syncopations. The upbeat melodies that Quickstep is danced to make it suitable for both formal and informal events. The Peabody is a Ballroom dance form similar to the Fox Trot made poplar at the beginning of the 20th century by William Frank Peabody, a N.Y. police Lieutenant and active dancer. The use of the Right Outside Partner position is a major characteristic of this dance form. For the most part, the Peabody is a fast One-Step danced to lively ragtime music. Get ballroom dancing in Sydney’s CBD today! 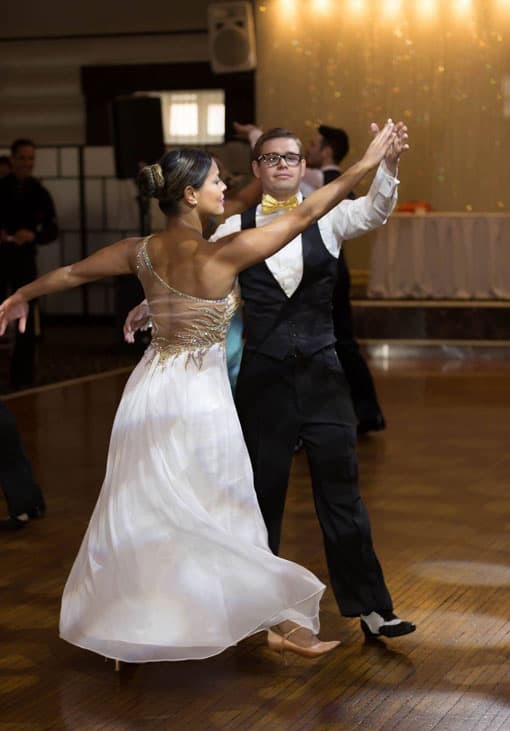 Whether you’ve been ballroom dancing for years, or you’re looking for a new hobby and would like some beginner classes, William Maslin is the studio for you. We offer both group and private dance classes, making it easier for everyone to learn at their own pace. We also offer a variety of other dance styles if ballroom isn’t for you! From Salsa to ballet, try it all in our Sydney CBD location. Book you first private class today!